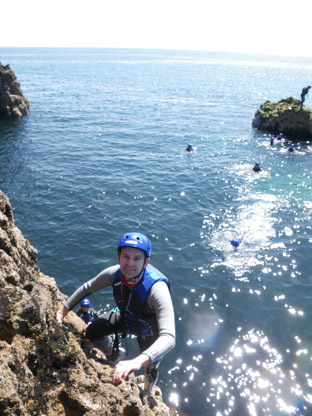 Prices for Coasteering Wales: Book the most exciting Coasteering in Wales, for coasteering in Pembrokeshire, and the Gower so try Coasteering Wales for an amazing coasteering experience. Our prices are all tailored to suit you and your group. If you have a small group of between 4 to 10 people and want a fantastic session of coasteering with all the big jumps, thrills and excitement that we can offer then it will cost £60.00 per person. If you have a large group of 11 to 20+ then it can be a lot cheaper, £50.00 per person. So give us a call and see what we can offer you and your group. Coastal Triathlon is for a full day and is the ultimate challenge. Costs are £95.00 per person with a minimum group of 6 if you have 8 or more than the cost is £90.00 per person. So give us a call and see what we can do for you and your group. During the coasteering we will be taking photos and videos of you and your party at all the best spots. We will then send all the pictures to your group organiser so that they can then send them to everyone. Don't forget, you can go coasteering in Wales at any time of the year as we supply full wet suits and a complete set of waterproof clothing as well as all the necessary safety equipment. Call 01989 566672 or 07854 819142 for full details. Thank you ever so for Saturday it was a brilliant day and everyone enjoyed it and felt a huge sense of achievement at the end of the day. My hubbie has been tasked with organising a stag party, so you may get a call from him to make a booking for next summer. Keep up the good work & I'm so pleased Leah & I found your website, it came up when we did a key word search on google for hen party outdoor activities in south Wales- perfect! Many thanks for Saturday. We all had a great day & everybody really enjoyed it. Even those a little 'wary' of heights! Would happily recommend you to anybody. Amazin! Thanks for a great Stag Day out, the lads thought it was amazing. Our thanks to the other instructors for their enthusiasm and humour. Thanks for the cd of photos, received them yesterday, there are lots of amusing pictures! Thanks also for all of your help to make it such a memorable and enjoyable day, it really was fabulous. Hi Michael! Just to say thanks again for the coasteering in Wales on Saturday - everyone really enjoyed it. Although I think there were a few aches yesterday, and they weren't just down to hang overs! If you could send the photo's as soon as you can as we all want to see them. we all had a fantastic time, we really enjoyed ourselves it was a day full of challenges and laughs. Chris and David were great really supportive whilst we were coasteering, very patient and good fun to be with. We would all sign up and do these activities again, it was a fun memorable weekend. Dear Michael, Thank you for a really fantastic day coasteering in Wales, the children all loved every minute of it and so did I. Just wanted to thank you on behalf of all of us for the coasteering on Sunday. A great time had by all, even better than the first time we came with you and everyone agreed they'd be up for a third time around! thank you for the coasteering, we all had a brilliant time. it ended up being a great weekend away and I'm sure we will all be back in the future. We had a fantastic time yesterday, thank you so much. From the feedback from the guys, I think we would very much like to do something along these lines again next year - assuming when we are a full team again the new members are up for this kind of activity. So we'll surely be in touch again in the not so distant future. I will also do some positive PR for you around the company and who knows, another department may decide to give it a go too. Thanks again and have a lovely weekend.